Our yard is a muddy mess after one of the coldest & wettest winters in my memory. We recently got to work making it presentable on a rare warm, sunny day. These guys were NO help at all! 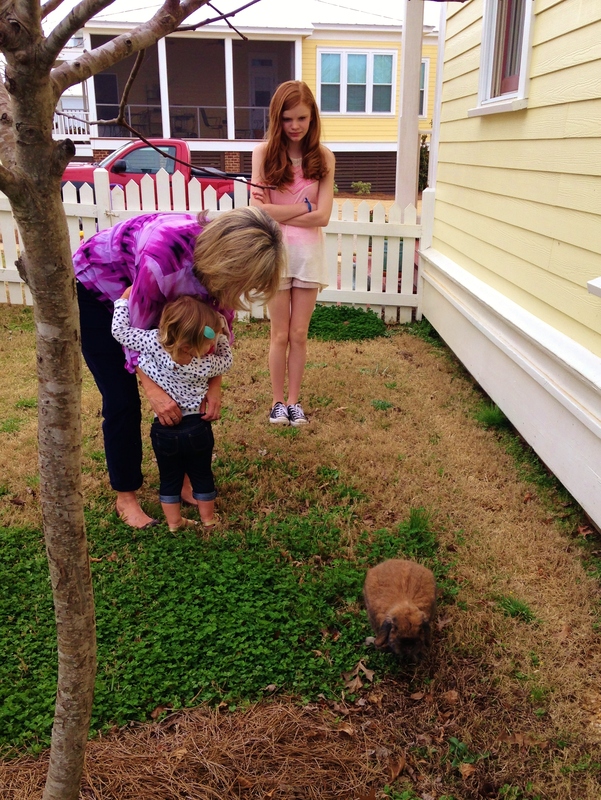 While we worked in the yard, some lovely ladies dropped in to bid salutations to a few of our cute animals. Brenda- my sweet neighbor and two of her beautiful granddaughters. 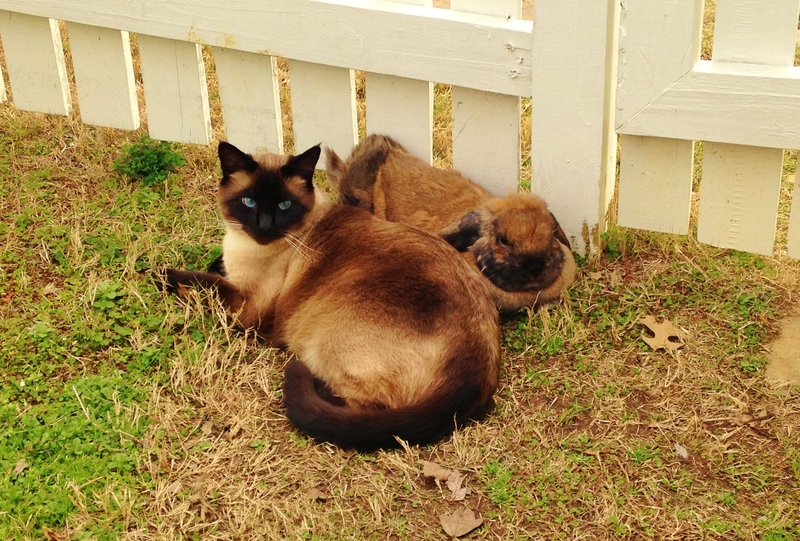 Little Vivi wants no part of that furry brown thing with the floppy ears! Caroline, however, recognizes a handsome gentleman when she sees one! 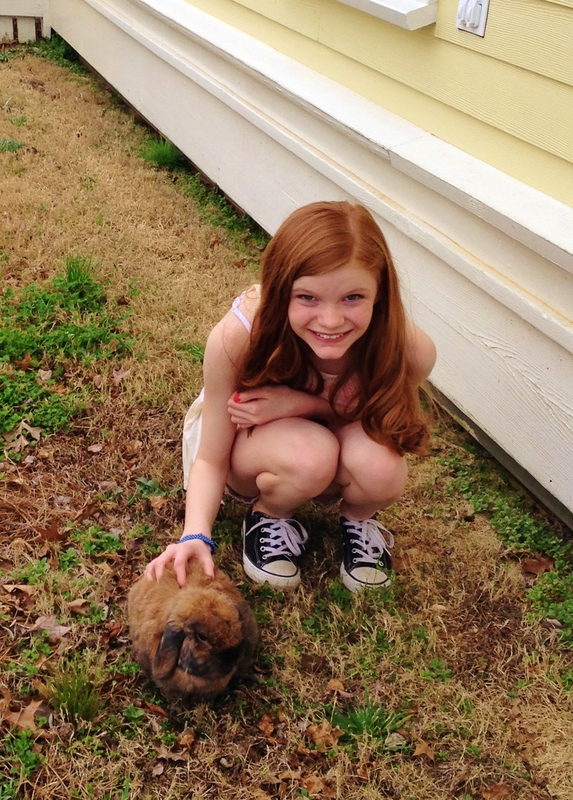 Caroline is one of my awesome pet sitters. She and Buster are BFFs. KITTY NEWS: Although G.T. 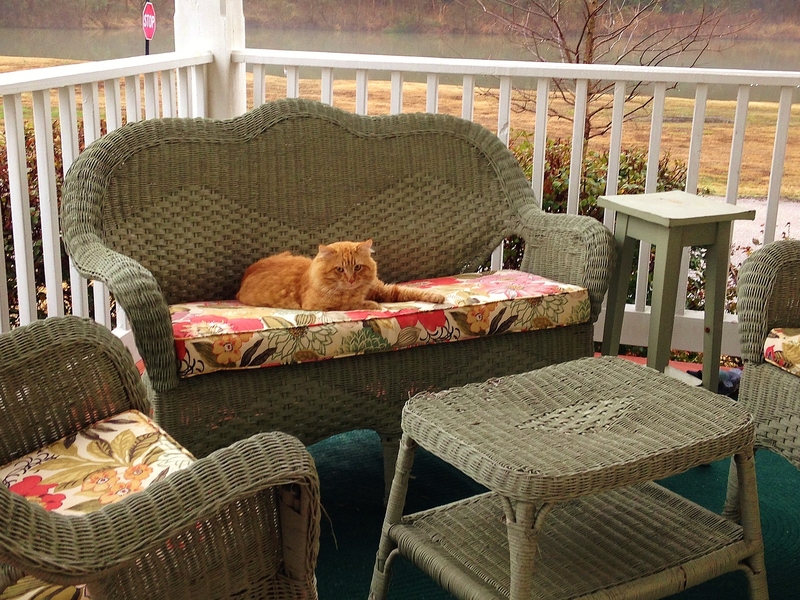 never came back to our porch we see “Orange Kitty” on a regular basis. She is a beautiful girl (We think she’s a girl–we can’t get close enough to tell). Like G.T. was in the beginning, she was super shy and would only eat food from our porch at night. She would run like crazy if she ever saw us. We still can’t touch her but she doesn’t run anymore, and if we’re late giving her food in the morning, she MEEEEEOWWWRRRRRRs really loud to let us know we’ve dropped the ball. People are so hard to train. 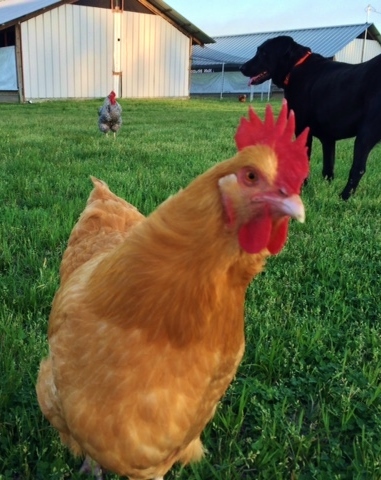 CHICKEN NEWS: Miss Daisy continues to enjoy farm life with her second Mommy Debbie. 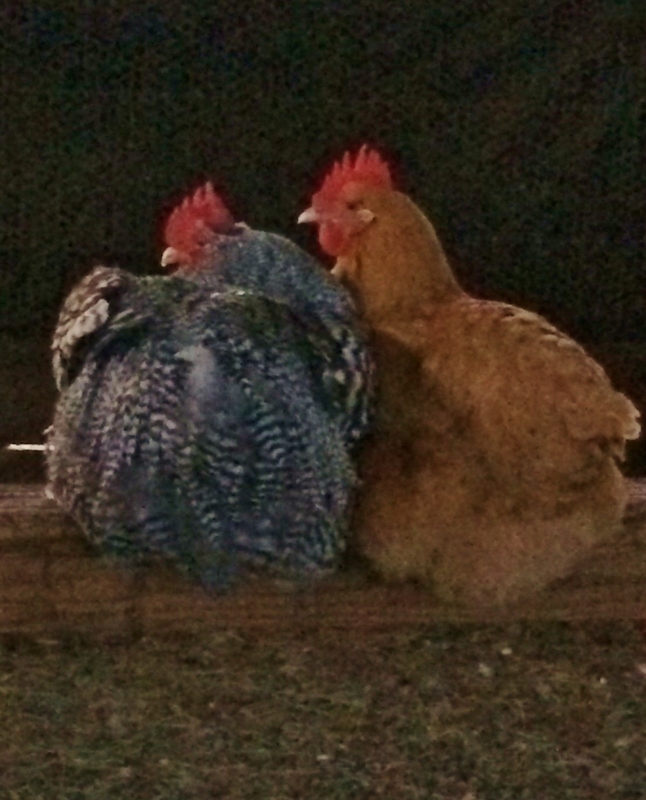 She and her boyfriend Claude are inseparable and roost together every night. Do I barge into YOUR bedroom??? I wonder what Daisy would think of the new pet my neighbor Amy brought me yesterday? 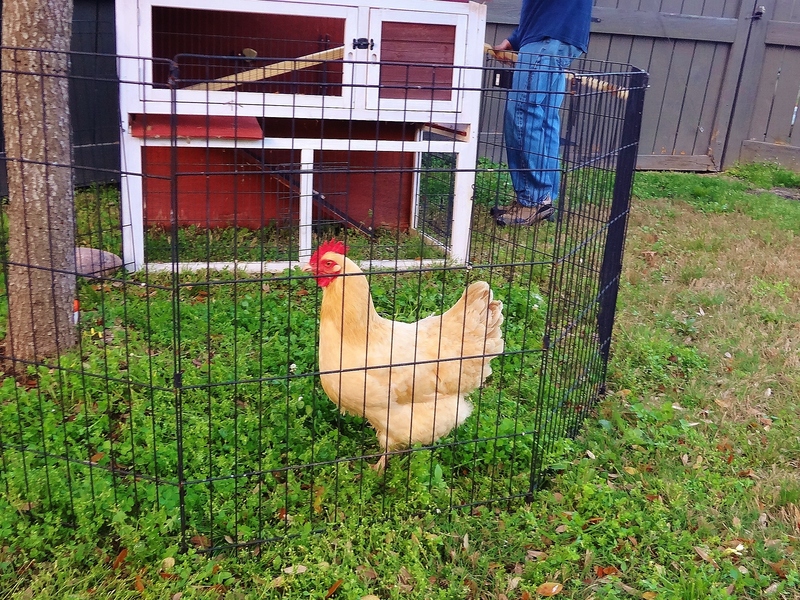 Meet Goldie my new foster chicken. Just remember! I was there FIRST! Don’t worry Daisy. You can NEVER be replaced in my heart. Now go keep an eye on Claude. Buffy looks hungry! More on Goldie tomorrow. It seems like I am forever destined to be the “Chicken Lady”. You’re not chopped liver yerself girlfriend!